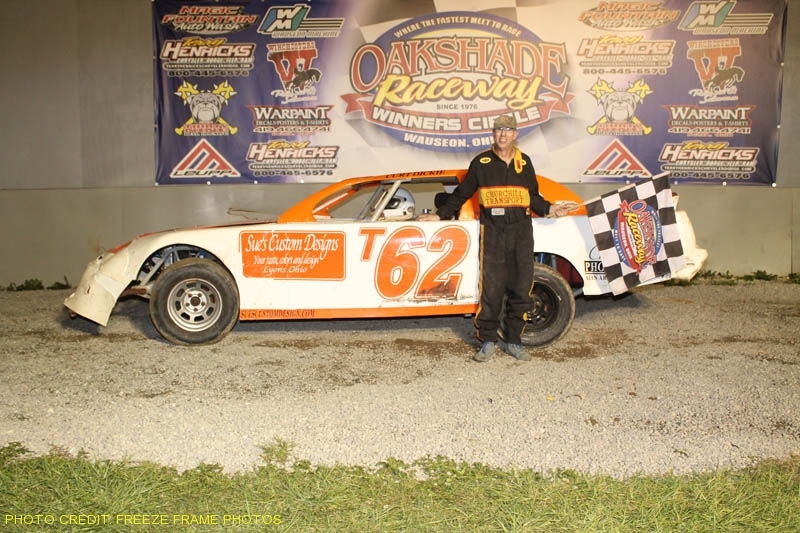 Racing fans at Oakshade Raceway were treated to some extra feature racing action on Saturday with a couple make-up features from July 16 for the Late Model and Sportsman divisions. The first of two Late Model Features took to the track as the evening’s first event under the bright sunlight. Dusty Moore assumed the lead at the start after starting on the pole. Kris Patterson and Rusty Schlenk put the pressure on Moore for the lead in the first few laps with Moore rising to the challenge. The first caution flag came out on lap four for a spin involving Brad Eitniear and Mike Miller. Moore had to fend off Patterson for the lead once again after the restart with Josh Steinacker and Schlenk trading the third position momentarily. Schlenk eventually disposed of Steinacker and briefly took second away from Patterson on lap eight. With Moore continuing to lead, Patterson got back around Schlenk for second, but that would only be a temporary set back for the 91 car of Schlenk. Schlenk eventually got the inside of Moore to battle for the lead. The two raced side by side for a while with Schlenk taking the lead by the nose of his car on lap 14. Schlenk went on to pick up his third Late Model Feature win of the year at Oakshade Raceway with Moore finishing a respectable second. Rody Schroyer and Brian Ruhlman started in the sixth row and ended up finishing third and fourth respectively. Hillard Miller started even deeper in the field in the 16th position and came away with a top five finish. Next to take the track was the first of two Sportsman Features. Things got a little hectic before one lap could be finished. Steve Kester, who started on the pole, spun in front of just about the entire field and brought out the caution. At least five other cars spun or stopped to avoid Kester. The result was a complete restart. Joe Derbeck led the first lap, but Ray Klawitter got by to take the lead by lap two and began to pull away. Derbeck was able to get to the inside of Klawitter on the restart after a couple cautions, but Klawitter held him off. Tim Fisher started 11th and worked his way up to second by lap 11, but could not reel in the race leader. Klawitter picked up the Sportsman Feature win over Tim Fisher, Joe Derbeck, Josh Steinacker and Mike Jessen. Later on in the evening, the fans were treated to some more great feature racing with the Late Model Feature first to take to the track once again. The second Late Model Feature was marred by numerous cautions. The first of couple came out before a single lap could be completed. Rob Mitchell spun and collect Ryan Gorey who ended up with a flat tire and Aaron Scott and Rick Delong made contact resulting in debris on the track and sent Delong to the pits. Rusty Schlenk was running third but retired to the pits under a lap three caution, ending his bid to make it two feature wins in a row on the night. Greg Martin took the lead from the start, but could not open up his lead as the field was kept tight with the many cautions. After a caution for Scott Fisk who came to a stop on the front stretch on lap 14, Greg Martin held off a three wide challenge from Casey Noonan and Hillard Miller for the lead. A few laps later Martin opened up his lead just a little over Noonan and Miller. Another caution with five laps to go allowed Noonan to close back up to the rear bumper of Martin for the restart and one lap later under the green, Noonan took the lead and drove away to his first Late Model Feature win of the year. Martin finished a strong second ahead of Miller. Dusty Moore finished fourth and Tony Marks was fifth. Brad Kendall, Chris Keller and Rusty Schlenk made the first handful of laps of the Sportsman Feature exciting with the three going three abreast on lap five. Keller squeezed out into the lead and Schlenk took second shuffling Kendall back to third. Two laps later, Schlenk once again retired to the pits giving up the second position. Keller opened up a huge lead on the rest of the field until the first caution flag flew with only three laps to go. Pete Dotson spun right in front of the race leader, but luckily Keller got by unscathed. Unfortunately his lead he built up was erased. Keller held off Tim Fisher and Brian Fisher to win the Sportsman Feature. Jessen finished fourth and the night’s earlier winner, Ray Klawitter, finished fifth. Finally the Bomber Features took to the track to close out the night with some of the night’s most exciting race finishes. Jake Rendel led most of the Bomber A Main with Craig Dippman glued to his rear bumper. Dippman began to challenge Rendel to the inside when the first caution flag came out for Todd Silvey’s spin with two laps to go. Dippman waited until the final two corners on the final lap to dive to the inside of Rendel again. Dippman came off turn four with a slight advantage on Rendel which turned out to be just enough. Craig Dippman won his first Bomber A Main of the year ahead of Rendel, Rich Risner and Gary Domoe. Jeff Foks, Jr. finished fifth. The Bomber B Main also produced an exciting finish. Chris Williams grabbed the lead from the start. A late caution set up another two-lap shootout to the finish. Williams had been battling with Curt Lancaster just before the caution and could not hold off the 51 car of Lancaster who took the lead on the final lap. And just to make things a little more exciting, Ted Goetz drove hard to the inside of Lancaster in the final corner in a last ditch attempt for the lead. Lancaster held him off to pick up his first Bomber Feature win of the year. Williams ended up third behind Goetz. Shane Stuckey who started in 21st, finished fourth and Bob Rendel ended up fifth. Hugh Snell, Ron Leonard and Ted Hill battled three wide for the lead early in the Bomber C Main. Snell was able to fend off the challenge until John Brooks closed in after starting in the middle of the pack and forced his way into the lead on lap six. Snell fell off the pace while running second and retired to the pits with only two laps to go. Brooks went on to pick up the victory with Ron Leonard finishing second. Bobby Hutchins was third, followed by Ted Hill and Eric Potridge. This Saturday Oakshade Raceway will host another American Late Model Series present by Sunoco program paying $2000 to the winner of the ALMS Feature. Sportsman and Bomber division will also be back in action. A week later, the Bomber division will run its make up double on August 13.